Championship titles very rarely get won in February but Renhold United will feel they have taken a very large step towards their first ever Premier Division supported by Sportsform crown on Saturday. A lone goal from Alex Woolston was enough to give them a 1-0 home victory over their nearest rivals Flitwick Town who now trail them in the league standings by some nine points having also played one game more. For Shefford Town & Campton, after a run of five consecutive defeats it was a return to winning ways with a 4-2 victory at Wootton Blue Cross thus ending their hosts’ seven game unbeaten run. Michael Jones netted twice alongside strikes from Andrew Hayday and Chris Slough against home replies via Ryan Mellor and Jo O’Donnell. The biggest winners of the day were AFC Kempston Town & Bedford College who claimed just their second home win of the season in beating Caldecote 11-0. Courtney Broughton and Andrew Latimer both netting hat-tricks, Josh Sturniolo a brace and also finding the back of the net were Mark Palmer, Tyrone Kelly and Aaran Chaplin. Elsewhere, Pavenham claimed their third home win on the bounce in beating bottom of the table Ickwell & Old Warden 2-1. James Owen netting both goals against a lone reply from Dean Hamilton. Whilst Marston Shelton Rovers fell to their fourth consecutive home defeat when beaten 2-0 by Wilstead. Callum Evans and Kieran Brasier netting the goals to do the damage. The scheduled Eastcotts AFC v Sandy game was waterlogged off. League leaders Elstow Abbey are now unbeaten in their last 11 starts after winning 2-1 at Meltis Albion. Callum Davenport and Jason Simons netting the goals against a home reply from Carl Townsend. Whilst second place Cranfield United extended their winning ways to seven games with a 7-1 victory at AFC Oakley M&DH Reserves. Jordan Appleton led the way with a hat-trick supported by strikes from Martin Holland, Liam Whitmee-Craig, David Adderson and Adam Hulks against a lone home reply from Stuart Kelly. Losing ground on the top two were both Henlow and Great Barford. 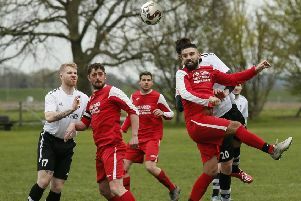 Henlow went down to their third consecutive home defeat when beaten 4-2 by a returning to in form Sundon Park Rangers. Shaka Anderson did the damage with a first half hat-trick which was supported by with a goal from Kane Griffiths against home replies via Keith Milburn and Adam Furness. Whilst Great Barford were held to a 2-2 home draw by AFC Harlington. Ben Stock and David Mulvihill on the home scoresheet against replies from Matt Jefferson and Scott Gadsden for the visitors. For Queens Park Crescents it was win number three on the bounce with a 5-2 victory at Bedford SA. Shahinur Rahman with a hat-trick and Fabio Sattar with a brace bringing up the nap hand against home replies from Richard Lightfoot and Justin Maling. Potton Town are now on a four game losing run after they were defeated 2-0 on home soil by a Riseley Sports side who had previously lost their last four outings. An own goal plus a goal from Paul Brown doing the damage. Also winning on the road for the first time in six away outings were Marabese Ceramics who won 3-1 at Shefford Town & Campton Reserves. John Vooght netting twice and Joe Follano once against a lone home reply from David Young. With Westoning having their home game against Meltis Albion Reserves postponed due to the state of the pitch at Greenfield Road they now drop down from third to fourth place in the league standings after FC Houghton leapt above them after winning 5-2 at Moggerhanger United. Lawrence Taylor, Alex Howells, Nathan Prime, Paul Taylor and Ali Mohiyaldeen all found the back of the net against home replies from Liam Donovan and Lee Adams. However, the biggest winners of the day were Elstow Abbey Reserves who ran out 7-0 home winners over Kempston Athletic. Myles Ferraro netting four times to go with single strikes from Shaun Cafferty, Matt Poulton and Lui Spinelli. Whilst Wootton Village returned to winning ways on home soil with a 1-0 victory over Wilstead Reserves thanks to a goal from Nick Burraway. Elsewhere, Caldecote Reserves were beaten 2-0 at home by Marston Shelton Rovers Reserves for whom Carl Borromeo and Anthony Henman netted the goals. Stevington will contest the final of this seasons Bedfordshire FA Junior Cup Final after a goal from Kieran Souter just 45 seconds into the game saw them win 1-0 at Cranfield United Reserves. Their opponents will be Luton District & South Beds League side Caddington Rangers Reserves who won 5-0 at Bedford United. There is no change at the head of the division three league table following wins for the top two sides. League leaders Flitwick Town Reserves with goals from Jonathan Duckett and Chris Bull running out 2-0 home winners over Atletico Europa,whilst second place Lea Sports PSG won 4-1 at Sandy Reserves thanks to two own goals and strikes from Ryan Durrant and Owen Malcolm against a lone home reply via Phil Beall. Elsewhere FC Serbia now find themselves unbeaten in their last eight outings following their 4-2 home win over Westoning U20., Vinny Mattu and Demilson Conceicao both netting twice against single strikes from Shaun Cooksley and Tom Smith in reply for the visitors. Whilst Dinamo Flitwick returned to winning ways with a 3-1 home win over Shefford Town & Campton A. Dan Goldie, Charlie Battams and Dom Loadman on their scoresheet against a lone Town reply from Matt Evans. The scheduled Caldecote U20 v Mid Beds Tigers game was waterlogged off.